The International Monetary Fund (IMF) recently issued a new working paper called “The Future of Oil: Geology versus Technology” (free PDF), which should be of interest to people who are following “peak oil” issues. This is a research paper that is being published to elicit comments and debate; it does not necessarily represent IMF views or policy. The geological view, used in peak oil forecasts, such as forecasts made by Colin Campbell and forecasts made using Hubbert Linearization. The analysis in the IMF Working Paper shows that neither approach has worked perfectly, but in recent years, forecasts of oil supply using the geological view have tended to be closer than those using the economic/technological approach. Since neither model works perfectly, the new paper takes a middle ground: it sets up a model of oil supply where the amount of oil produced is influenced by a combination of (1) geological depletion and (2) price levels. This blended model fits recent production amounts and recent price trends far better than traditional models. The forecasts it gives are concerning though. The new model indicates that (1) oil supply in the future will not rise nearly as rapidly as in the pre-2005 period and (2) oil prices are likely to nearly double in “real” (inflation-adjusted) terms by 2020. The world economy will be in uncharted territory if this happens. It seems to me that this new model is a real step forward in looking at oil supply and the economy. The model, as it is today, points out a definite problem area (namely, the likelihood of oil high prices, if growth in oil production continues to be constrained below pre-2005 rates of increase). The researchers also raise good questions for further analysis. At the same time, I am doubtful that the world GDP forecast of the new model is really right–it seems too high. The questions the authors raise point in this direction as well. Below the fold, I discuss the model, its indications, and some shortcomings I see. Economic /Technological Approach. With the economic/ technological approach, the assumption is made that high oil prices will encourage substitution and/or new oil production. Because of this, high oil prices are not expected to persist. Instead, the most important consideration in determining future oil supply is the level of future demand. The level of future demand, in turn, is primarily driven by anticipated GDP growth, since world GDP growth and world oil production growth tend to be highly correlated. In effect, models of this type assume that whatever oil supply is needed will be available; they don’t consider the possibility that geological considerations may limit oil supply over the long term. As an example of how well these models have worked for prediction, the paper shows a graph of historical EIA forecasts (Figure 1, below). Figure 1. Graph showing that oil production forecasts by the US Energy Information Administration have been revised downward, year after year, from paper. Each year, EIA’s forecasts have been adjusted downward, because actual oil supply growth was lower than forecast. Models Based on the Geological View. The paper considers forecasts of oil supply such as those of Colin Campbell (shown in ASPO-Ireland Newsletters) and forecasts based on Hubbert Linearization to be models based on the Geological View. The paper observes that forecasts of oil supply based on geological view have tended to be too low, but not by as big a margin as those made using the economic/technological approach. 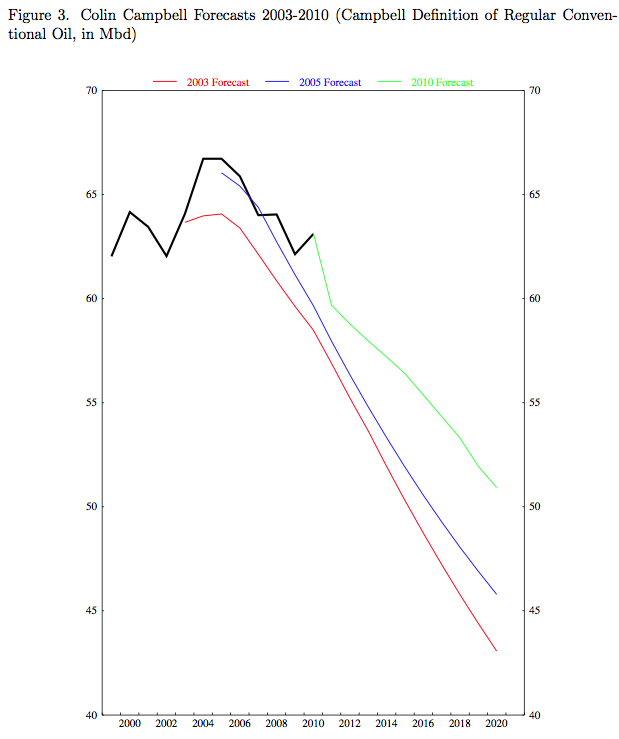 As an example, it gives the following graph of changes in forecasts by Colin Campbell. Figure 2. Colin Campbell Forecasts of Future Oil Supply, from paper. A review of the two methods by the IMF group indicates that neither works precisely as hoped, but each has some validity. While oil production did not rise as fast as the economic/technological view would predict, higher oil prices have allowed oil production to stay on more or less a plateau after 2005, rather than declining as predicted by geological methods. The new model in the IMF Working Paper combines indications from both points of view, using an approach that allows them to estimate the relative contribution of geological impacts vs higher prices. In the above equation, qt is the quantity of oil produced in year t and Qt is the cumulative quantity produced in year t, so the ratio qt / Qt produces the familiar downward-sloping line one sees in charts used for Hubbert Linearization. The first two terms to the right of the equal sign are the ones based on the geological approach to depletion. The later terms depend on pt, which is price of oil at the time “t”. Adding the pt terms tends to raise the line at later periods so it does not slope downward as quickly as if depletion were the only factor affecting the relationship. Apart from allowing for an effect of higher oil prices on the growth rate of potential output, the model also allows for the possibility that higher oil prices can cause fluctuations in the amount of excess demand in the economy. . . . Similar to the equation for potential, the coefficient estimates show that high oil prices have a small but significant negative effect on excess demand, and that this effect is highly persistent. When all is said and done, what does the IMF model forecast? Figure 4. 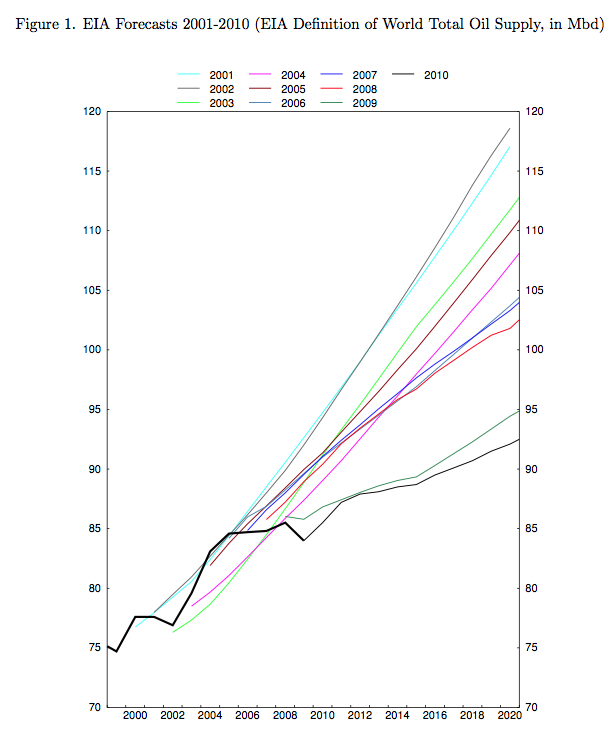 Oil Output Forecast with Error Bands, (in gigabarrels per year), from report. 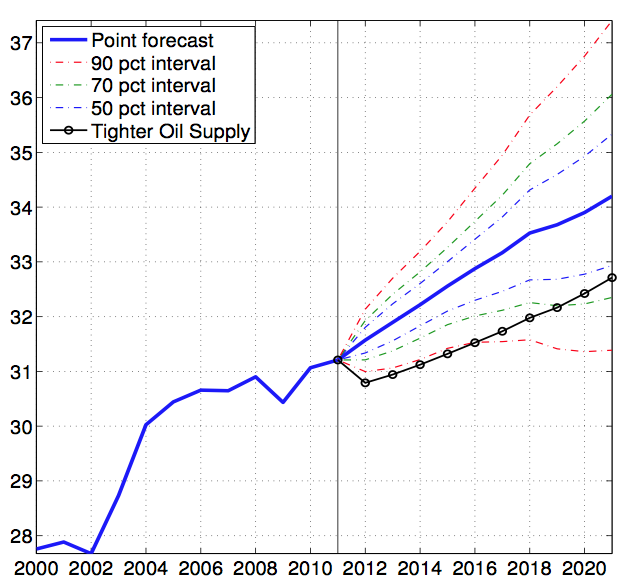 The forecast for future world oil supply, shown in Figure 4 above, is similar to EIA’s most recent forecast of world oil supply (but lower than earlier EIA estimates). Oil supply is expected to rise a 0.9% per year. An alternate tighter oil supply forecast is given as well. The forecast for world GDP growth (shown in Figure 5 below) is not too much different from standard estimates, either. The point forecast is about four percent per year. Figure 5. World GDP (in logs) forecast with error bands, with 2011 world GDP normalized to 1.00, from report. The thing that is different in this analysis is oil prices (in inflation adjusted dollars). Forecast oil prices are expected to be much higher that what the EIA is estimating. Figure 6. 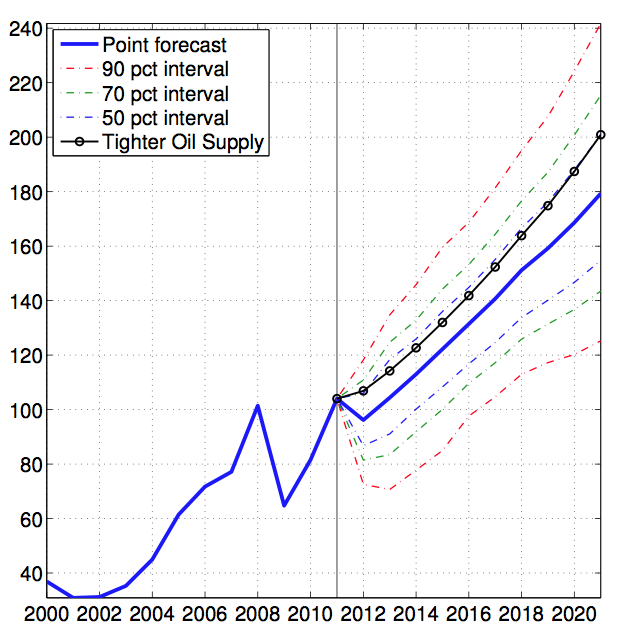 Oil price forecast with error bands (in 2011 Real $) from report. The predicted average annual growth rates of oil output are well below the historical forecasts of EIA, but above the forecasts of proponents of the geological view. . . . However, this projected positive trend in oil production comes at a steep cost, because the model finds that it requires a large increase in the real price of oil, which would have to nearly double over the coming decade to maintain an output expansion that is modest in historical terms. Such prices would far exceed even the highest prices seen in 2008, which according to Hamilton (2009) may have played an important roll in driving the world economy into a deep recession. 1. Impact of high oil prices on GDP growth. The expected impact of a continued rise in oil prices on forecast GDP is small, according to the model as constructed. Perhaps the relationship should be non-linear (convex) instead of linear. More generally, what is the importance of the availability of oil inputs for continued overall GDP growth? The report mentions studies showing the close connection between energy growth and GDP growth, such as by Ayers and Warr. 2. Substitutability for oil. What is the substitutability between oil and other factors of production? 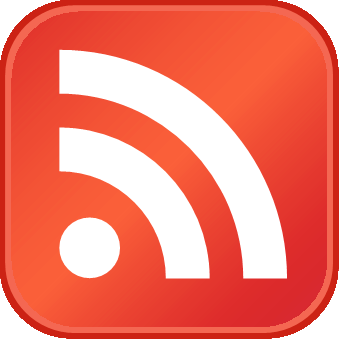 Is it reasonable to assume that elasticities of substitution will become greater over time? Or is there a possibility that there are limits to the extent of substitutability of machines and labor for energy? 3. Is there a pain barrier? At some point, does the effect of high oil prices on the economy change, and become much worse? 4. Independence of Technology from Fossil Fuel Availability. Perhaps a reduction in fossil fuel availability will negatively affect the availability of future technology improvements since, for example, it takes fossil fuels to make new more efficient cars. This has not been reflected in the model. 5. Smaller Amounts of “Spare” Oil Capacity Available in the Future. 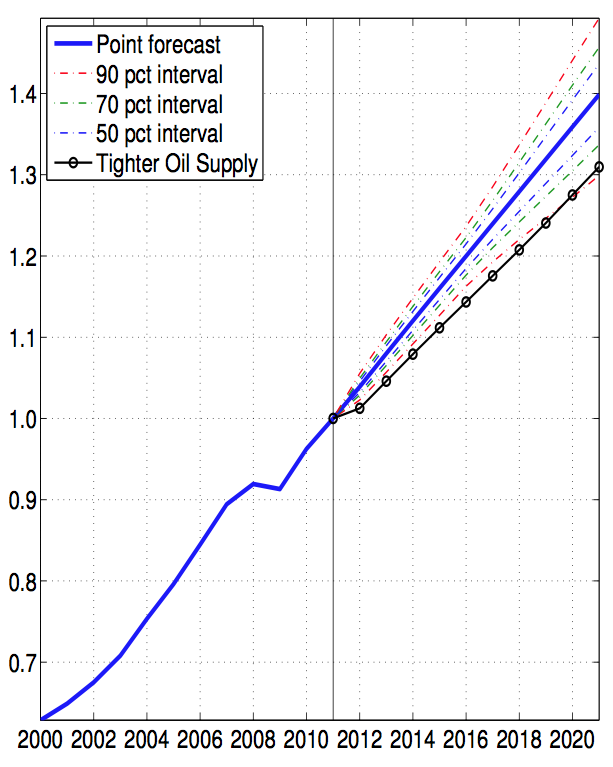 The model reflects amounts of OPEC spare oil production capacity available in the past. In the future, less spare production capacity seems likely. The IMF is to be commended on putting together this analysis. To me, the big step forward is that questions about the impact of geological depletion of oil on the economy are starting to be addressed. The fact that the paper also points out the level to which oil prices will need to rise, if oil production is to rise at 0.9% a year between now and 2020, is important as well. a. Trend Toward Globalization. The trend toward globalization has allowed greater synergies to occur, and thus has contributed to world GDP growth. The trend toward globalization started over 4,000 years ago, with trade from northwest India to the Mediterranean region (Chew). In recent years, we seem to be approaching a maximum level of world globalization. In fact, higher price of oil has been raised as an issue cutting back on trade of bulky, low valued items (Rubin). 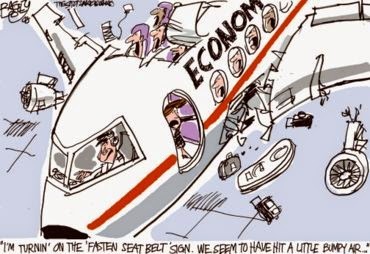 Higher cost of oil may also have an adverse impact of commercial airline flights for international companies to oversee their distant operations, because the costs of these flights is now supported by a large number of international tourists, and this international tourist trade may dry up. Thus, the trend toward globalization that has been supporting world GDP growth in the past may not persist, and may even reverse. b. Growth in Education. Part of what has supported world GDP growth is likely growth in education, since literate workers are better able to use technology. There is evidence that the advanced economies are now plateauing in terms of educational level of new workers, relative to the existing work force. Even less advanced economies, such as China, are showing much higher levels of literacy. (See this post). To the extent that educational levels are reaching a plateau, the “boost” to historical GDP rates that came from this factor can be expected to be lessened. c. Growth in Debt. GDP growth is enabled by debt growth. Consumers are able to purchase more goods and services, with increased levels of debt; businesses are able to increase their investment in new plants and equipment through more debt; and governments are able to undertake the development of new construction, roads, and other development, through the addition of more debt. But we seem to be reaching limits on debt growth. Theory also suggests that higher levels of debt are enabled by higher economic growth rates (Tverberg). Governments have been aware that increased borrowing can be used to pump up economic growth, but limits are being reached on the amount of debt that can be added. To the extent that debt fails to grow as quickly in the future as it has in the past, this can be expected to have an adverse impact on world GDP growth rates. d. Quantitative Easing and Extraordinarily Low Interest Rates. An argument can be made that GDP growth of advanced economies in recent years has been held up by quantitative easing and extraordinarily low interest rates. These would seem to be a temporary fixes that cannot be continued long-term. If this is the case, world GDP rates can be expected to be lower in the future, regardless of oil supply growth. 2. Limits on Substitutability of Other Fossil Fuels for Oil. The paper does not address the issue of whether there are limits of substitutability of other fossil fuels for oil. Stationary (as opposed to transportation) uses of oil have been substituting away from oil for years. There are millions of vehicles and other machines that use oil currently in operation. There will be a high cost in replacing these before the end of their normal lifetimes. Also, significant fossil fuels will be required for making vehicles and supporting infrastructure that use another fossil fuel source. 3. 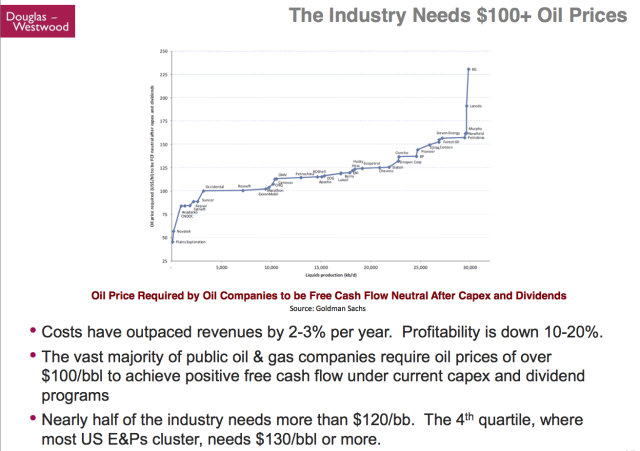 Limits on Capital Available for New Investment in Substitutes for Oil, and in New Oil Production. In recent years, we have made heavy use of debt financing for new investment. Government subsidies have also been used. To the extent that debt financing and government subsidies are less available, less investment can be expected in the future. 4. Impact of High Oil Prices on Diverse Parts of the Economy, Not Reflected in the Model. For example, prices of homes may be affected by high oil prices. People with less discretionary income are less likely to “trade up” to a more expensive homes, so high oil prices seem to be one of the reasons for the decline in home prices (Tverberg). Lower home prices affect ability of homeowners to borrow against the value of their homes for new purchases, so affect GDP, apart from oil price’s direct impact on the number of new homes built. 5. Which comes first: Oil Growth or Economic Growth? The assumption in the model is that GDP growth drives oil growth. While this is true, it is to some extent a “chicken” and “egg” situation. Perhaps the availability of inexpensive oil and other fossil fuels is one of the main drivers of economic growth (in addition to the other drivers I mention in the subparts of Item 1 above). Perhaps the cycle is started by the availability of cheap fossil fuels for industrial use and continued by the increased demand to which this growth gives rise. I appreciate the work that has been done by the IMF in putting together this model and look forward to seeing further enhancements to the model. The work that has been done and the questions that are being raised are important ones. I expect that commenters to this post will be able to point out other plusses and minuses of the model. The report itself is very interesting. Again, it can be found at The Future of Oil: Geology versus Technology.